The technology sector has been red hot for more than a decade. That fact has caused investors to pour billions into ETFs that provide them with broad-based exposure to the sector. 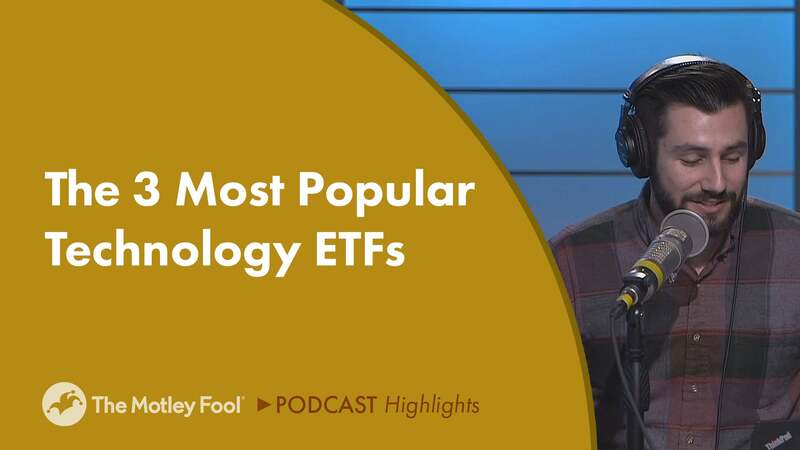 In this episode of The Motley Fool’s Industry Focus: Tech, host Dylan Lewis and Fool.com contributor Brian Feroldi discuss three of the biggest tech ETFs on the market: the Technology Select Sector SPDR (NYSEMKT: XLK), the Vanguard Information Technology ETF (NYSEMKT: VGT), and the First Trust Dow Jones Internet Index (NYSEMKT: FDN). Brian Feroldi: They separate themselves in a number of different ways. Some own everything that’s related to tech, where others take a niche focus and only buy semiconductor stocks or only cybersecurity stocks. Some of them take a regional focus, so they only focus in the U.S., or they only invest in China, or they only invest in Israel. Some are weighed by market cap, some are equal weighed, and some are even actively managed vs. passively managed. There are tons of different ways for investors to get exactly the exposure that they want with ETFs. Dylan Lewis: Why don’t we kick things off talking about the best-known ones? There’s a very large class of tech ETFs that have done quite well over the last couple of years. Let’s start with some of the big names, Brian. Feroldi Sure. The first and the biggest tech ETF out there is called the Technology Select SPDR Fund, XLK. This is just an index fund that tracks all of the technology stocks that are components of the S&P 500. That includes 69 different holdings. This fund has been around for 20 years now. It’s huge. It’s got $20 billion in assets, it’s very liquid, very easy for investors to get in and out. And even though it has a huge number of holdings, its expense ratio is very low, a 0.31% expense ratio. So if you want easy access to technology, you want to get exposure to all of the S&P 500 tech stocks, this is a very easy fund to invest in. Lewis: As you might imagine, something covering the tech space is going to have a lot of exposure to the major players. That ETF has a lot of exposure to Microsoft and Apple. Combined, they make up about 35% of the exposure in the ETF. Brian, we can’t talk ETFs and passive investing without talking about Vanguard, too. Feroldi: Yeah. Big surprise, Vanguard has a fund, and big surprise, it’s hugely popular. Vanguard’s tech fund is called the Vanguard Information Technology ETF, VGT. This is an index fund that tracks information technology companies that exist beyond just the S&P 500. In this fund’s case, there are 320 different stocks that are held inside of it. It’s also very big. It’s been around for 15 years, and it has $19 billion in assets under management. As you’d expect from any Vanguard product, it also boasts a very low expense ratio. This fund is just 10 basis points per year, very cheap. Lewis: Alright, we have one more that I think is part of the larger tech consciousness with ETFs, and that is First Trust Dow Jones Internet Index, FDN. Somewhat similar to the ones we’ve talked before. A little different, though. Feroldi: Yeah. This is a market cap weighted index of the largest and most liquid U.S. companies that are just focused on the internet, which is obviously a very broad term. This fund holds 43 different companies. It holds about $8 billion in assets under management. It’s been around for about 13 years. One thing that separates this fund from the other two that we mentioned is it includes a little tech company called Amazon, which is actually classified as a retailer in many ways, so it’s not included in some indexes, which is a little bit strange. This fund has done extremely well. It does have a much higher expense ratio than the other two we mentioned at 0.53%. It’s nearly five times more expensive than the Vanguard product. Having said that, it does give you a more complete view, one could argue, of the tech sector because it does include Amazon. Lewis: Brian, your point right there is exactly why you need to dig into what the underlying assets are for whatever you’re investing in — ETFs, mutual funds, doing your homework on individual stocks. You might buy an information technology ETF thinking you’re getting exposure to Amazon, only to find out that the industry classifications aren’t going to help you out there. Feroldi: Yeah, it’s always good, before you buy an ETF, just crack it open, look at the top 10 holdings. See how concentrated it is. See if it’s market cap weight or equal weight. That can give you a much better idea of what you’re investing in. Lewis: Yeah. Looking at that class of ETFs, we have some pretty killer performance over the last couple of years compared to the S&P 500, Brian. Feroldi: Yeah, all three of these funds that we just mentioned are big and they have just crushed the market. Over the last 10 years, the S&P 500 total returns, which means including dividends, is up 335%. That’s obviously an outstanding performance on its own right. The XLK is up 468%. The VGT is up 551%. And the FTN, over that same 10-year stretch, is up 840%. So you’re talking about 500% outperformance for the FTN vs. the SPY over the last decade. Lewis: Yeah. That’s why it’s worth digging in, right? That exposure to Amazon, a little helpful in juicing those returns, Brian. Feroldi: [laughs] Slightly helpful, yes. Lewis: So, those are some of our broad-based ETFs that tech investors might want to have on their radar if they’re looking for some instant diversification and nice exposure to the tech space in general. John Mackey, CEO of Whole Foods Market, an Amazon subsidiary, is a member of The Motley Fool’s board of directors. Teresa Kersten, an employee of LinkedIn, a Microsoft subsidiary, is a member of The Motley Fool’s board of directors. Brian Feroldi owns shares of Amazon and Microsoft. Dylan Lewis owns shares of Amazon and Apple. The Motley Fool owns shares of and recommends Amazon, Apple, and Microsoft. The Motley Fool has the following options: short January 2020 $155 calls on Apple and long January 2020 $150 calls on Apple. The Motley Fool has a disclosure policy.